Blue House Farm01621 862960work Nature ReserveIt is a working farm, mainly coastal grazing marsh with an area in arable production. Most of the farm was originally saltmarsh until sea walls were constructed to capture land from the sea. It was then used as grazing pasture, this practice continuing today. Some of the higher, drier fields are used for crops and about 90 acres are in cereal production. The farm is a Site of Special Scientific Interest (SSSI) as part of the River Crouch Marshes, notified for its wetland bird species and rare water beetles. It is within the Essex Coast Environmentally Sensitive Area (ESA) which encourages land owners to retain and recreate coastal pastures and to increase areas of conservation wetlands. The flat fields between the farmhouse and the sea wall are used in winter as a feeding ground by brent goose. 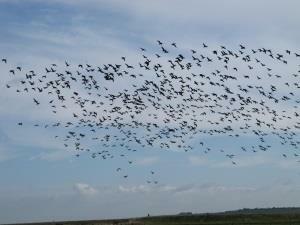 Often more than 2,000 geese are seen, together with large numbers of wigeon grazing on the short turf. Throughout the year hares are abundant and are most easily seen on these fields where cover is scarce. Skylarks also thrive, and are often heard singing high overhead in spring and summer. The fleets provide deep water which is important for diving birds including tufted duck and little grebe. Our smallest duck, the teal, and our largest, the shelduck, are both commonly seen. At high tide sea birds move on to the fleets from the mudflats beyond the sea wall. The creeks and ditches within the traditional grazing marsh are important habitats for rare water beetles and other water insects like the hairy dragonfly and scarce emerald damselfly. Those with thick vegetation support water voles and may, in time, again give shelter to otters, known to have lived here at least until 1963. The marshy fields attract wading birds such as redshank, curlew and snipe which feed on creatures within the boggy ground. The saltmarsh and intertidal mud beyond the seawall provide abundant food for wading birds like these and for oystercatchers and black-tailed godwit. Like most coastal grazing marsh the land was extensively drained for agriculture. The Trust is putting in sluices to raise and control water levels, vital for the wildlife. The level of grazing is also critical, so we are working towards a balance between good livestock farming and good conservation. It is a working farm, mainly coastal grazing marsh with an area in arable production. Most of the farm was originally saltmarsh until sea walls were constructed to capture land from the sea. It was then used as grazing pasture, this practice continuing today. Some of the higher, drier fields are used for crops and about 90 acres are in cereal production.